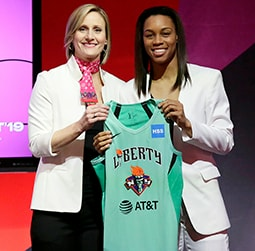 NEW YORK, NY – October 5, 2018 – Kia Vaughn wrapped up her second consecutive season with the New York Liberty, sixth season in the Empire State, and has slotted herself among the top-10 rebounders in franchise history. 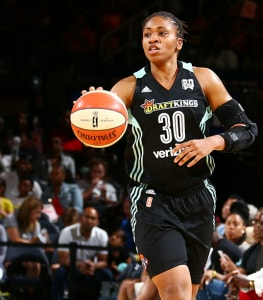 On August 6, in a contest against Seattle at Madison Square Garden, the Bronx native passed Liberty legend Teresa Weatherspoon to move into fifth in franchise rebounds with 753. 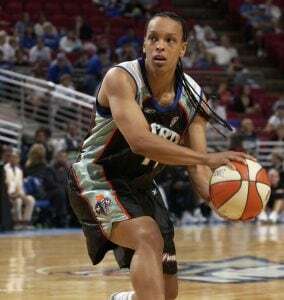 Vaughn has amassed 763 in ten seasons in the WNBA and sits sixth on the program leaderboard. She averaged 4.0 boards per game this year-1.2 on the offensive end and 2.8 on the defensive glass. On July 1 against Chicago, Vaughn picked up her first double-double of the season, finishing with 12 points and 11 boards, including a season-high five offensive rebounds. This concluded a three-game span that included her former team Washington and Chicago twice, where she averaged 12.3 points and 7.0 rebounds in 23.5 minutes per game while shooting 73.4 percent from the field. Vaughn logged four double-figure scoring performances seen against Washington (6/28, 16 pts), Chicago (7/1, 12 pts), Seattle (7/3, 10 pts) and Los Angeles (8/14, 11 pts). The center started 27 games of the 29 she appeared in. Vaughn missed the first two regular season games due to overseas obligation and missed the final two games of the season to rehab a right quad strain. 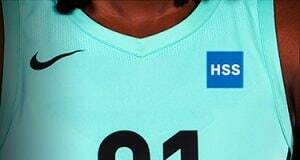 The 6’4 force inside has hauled seven or more rebounds on five occasions this season which included her near double-double effort of 10 points and eight rebounds on August 14 against Los Angeles which served as her second to last game of the season. On the year, Vaughn averaged 6.4 points, 4.5 rebounds and 0.7 assists per game in 19.2 minutes. Her 20 assists on the year tie as her highest in four seasons and her point total outdid her scoring production from a season ago.